Edited- Recently re-listed to the HP Methods series and still love it. The other fics and essay posts are also thought-provoking. —- I love this podcast! So professional and fun but with complex adult situations and thoughts. So glad I now have more intelligent fanfic/podcast options than I previously expected! This is honestly one of the best podcasts I have ever listened to. The quality is great and the content is even better! I've just finished this and I have few words that come to mind. I've read literally hundreds of novels and most of them were good, many of them were great, a few were truly spectacular. This brings one of the greatest novels I have ever read to life in a way that only improves upon it. Should you ever only listen to one podcast, and if you like intelligent fiction and Harry Potter or if you ever asked "Why didn't they just..." while reading Harry Potter, you should listen to this podcast. There are some episodes where he includes other fiction, and frankly I skipped most of them the first time around and you probably will too. There are alright. But Harry Potter and the Methods of Rationality is truly spectacular. And, it's free, so you have no excuse not to listen to it. I found out about this after it was done and promised myself I would read the e-book first before re-reading in podcast form, but made an exception for a car trip and listened to one episode about 1/4 way in, then binged the rest of the story in 3 days. I'm now on a mission to read everything Eliezer Yudkowsky has written and find any other podcasts associated with Eneasz Brodski. Really love the production on this read. Lots of fun, a real labor of love. An Epic podcast produced by a fantastic team of the most amazing people ever. Thank you so much guys! More real to me now than the books! It's a great spin off story of Harry Potter that is both adventure and intellectual. If you're interested in psychology and human behavior this is a good listen for you. An amazing remediation of a life changing book. This free podcast is higher quality then most professional, payed audiobooks. The stories besides methods are also well chosen and read at the same quality. I wish everyone would listen to this, it really can improve your life. This is an extremely well-done podcast by volunteers. It is better than many professionally produced audiobooks I’ve read. The storyline is fun and has some great thought experiments on how magic could work and how to do scientific testing with it. This is an extraordinary work that gives an entirely new twist to the Harry Potter multiverse. Very well written, and an excellent job done by the entire team that converted this story to a podcast / audiobook format. This is definitely an eye-opener. If it doesn't get you thinking or re-evaluating your surroundings, you've missed out on some of the wonder this has to offer. As much as I loved HPMOR, I was a tad apprehensive about the podcast. How could an enactment possibly live up to such an astounding piece of fiction? I was very glad to find my reservations to be unfounded. Brodski & the crew managed to bring HPMOR to glorious, surround-sound life. Years of work paid off with this excellent rendioning of a wonderful piece of literature. The podcast makes the material very engaging and it has genuinely improved my life in a significant way. Many thanks. Can't wait for the end to roll in soon! Incredibly entertaining and well thought-out parallel universe of Harry Potter. Like a rationalist, come to it with an open mind, and you'll be amused by Harry's cunning. A shocker here and there keeps the story far from being mundane or a repetition of the canonical adventures. This is a great story and I first fell in love with it by listening to this podcast. The voice actors are great and the sound effects make it even more immersive. I’m a big fan of the Harry Potter series by J. K. Rowling. I’ve read all seven novels multiple times. And as a result I can say how impressive it is that Rowling hides numerous clues in plain sight in volume 1, the significance of which are not revealed until volume 7. Amazingly, having now listened to this podcast numerous times (it’s not quite done yet; 3 more chapters to go, but I’ve read these in print form), that Eneasz Brodski has accomplished the same thing. Very clever clue dropping throughout the book, the significance of which only becomes clear at the end. Clearly, even though the book was printed as a serial that came out over (I think) 5 years, he had all the clever plot details planned out from the beginning. Anyone—EVERYone—who is a Potter series fan AND a rationalist, an economist, a libertarian, a devotee of reason and science, or just a nerd, will LOVE this work. I cannot praise it highly enough. The clever tweaks on the original Rowling story…the introduction to rational thinking…the application of economic reasoning. It’s SO good. AND the PODCAST makes it even better. The clever voices, music, sound effects. Clearly a work of love and devotion. (Sorting) Hats off to everyone. One of my favorite fanfics as an audiodrama? Hell yeah. Great Story and a Great Multi-Voice Reading! After reading the first few chapters a couple of months ago, I began listening to the podcast exclusively to follow the story. Taking into account how long it has taken me to finally catch up to the current podcast is a testament to just how much time and effort has gone into this porduction over the years. To me, these voices are the characters and I couldnt be more happy about that fact. This is some high quality entertainment. This is probably in the top 3 of all my favorite podcasts. As a die hard Harry Potter fan, I was skeptical as to how much I would like a story line that was not true to the original works, but after just two episodes I was hooked and have been listening non stop. I don't know what I'm going to do when I catch up and have to wait two weeks between each new episode. This podcast makes you think, pokes and prods and what you think you know, and kick starts your creativity like no other podcast I have listened to. Great work! This is a great podcast. The story is its own, with some fun nods to the original series, and some inventive new additions. It gets its rationalist view point across while staying inside the plot and being very entertaining. The podcast itself is well produced and utilizes many quality voice actors that, along with the narrator himself, sound great. Thanks for the hard work! Wonderful story, amazing podcast. I wish this could be required reading / listening for anyone interested in being a scientist! This show is extremely well put together. The quality is on par with shows that have full teams of creators. A huge cast of voice actors, occasional sound tracks, and effective use of sound effects (not to mention a wonderful narrator) make this a fantastic show. Great in addition to the written chapters, but completely sufficient on it’s own as well. I’ve been listening to this podcast for years. The quality just keeps getting better and better, and the audience participation in narrating the story has been fun and interesting. While reading HPMOR is awesome, the podcast adds new life to the story, and engages me in a new way. I definitely recommend you try it out! I have relistened to this podcast in its entirety at least 10 times. This is a wonderful story with great variations on Rowlings characters. I sometimes even forget that I am also learning really useful critical thinking skills. I love this so much! Thanks for all your hard work on this podcast!! This podcast steadily improves in quality as time goes on. By the end it sounds almost pro and the voices for all the different characters are always good. Highly recommend. I loved reading this story and the podcast version is fantastically done as well. The podcast is professional and fun to listen to! Hollywood should make a movie out of this one! I love HPMoR! Its perfect for my hour long commute. I was listening to 18a and I couldn't help but notice that Snape sounds like the one from Potter Puppet Pals. Was that intentional? Because it was freakin hilarious. Also, the voice actor for Dumbledore is epic. I love it! This podcast is simply fantastic. The narrator has a very fitting voice, and despite his self-recriminations, he's quite excellent at differentiating the characters. I've been listening for several weeks now, and I always look forward to the next episode! Sorry this review isn't more useful. I am not a clever man. A great reading of MoR, the narrators voice has become my vision of Harry. 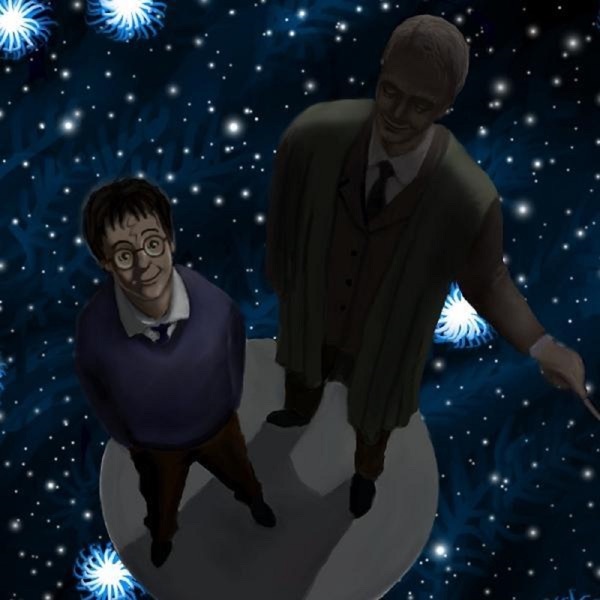 I recomend this podcast to any fan of Harry Potter or those interested in rationality/logic. There are a few distracting audio inconsistencies in some of the voices but they show up late enough to where you're already hooked.